Kirby Super Star is a platforming game developed by HAL Laboratory and published by Nintendo. It features eight unique games and mini-games such as Spring Breeze, Dyna Blade, Gormet Race, The Great Cave Offensive, Revenge of Meta Knight, Milky Way Wishes, and more. 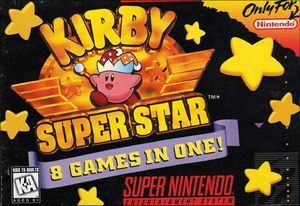 Kirby Super Star introduces the option for Kirby to transform his ability into a helper, which can be controlled by a second player for co-op multiplayer. The graph below charts the compatibility with Kirby Super Star since Dolphin's 2.0 release, listing revisions only where a compatibility change occurred. This page was last edited on 10 December 2017, at 22:14.